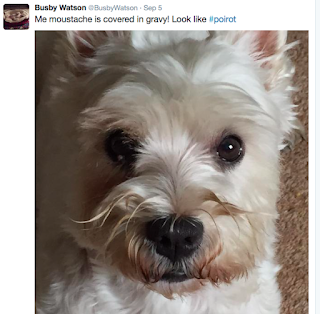 Reading, Writing and a Few Dog Stories: Dogs on Twitter? Here’s something you may not know. Thousands of dogs all over the world have their own Twitter accounts. Can you believe that? Okay, let me go back. I was one of those people a bit dismissive of Twitter. I chortled disdainfully along with Jon Faine when he relayed the news to radio world that there were rumours of YouTube merging with Twitter and Facebook to form a conglomerate known as YouTwitFace. I applauded the divine Miss Kitty Flanagan when she did an hilarious skit shouting Twitter-type information loudly, from a park bench. Who cares, I thought, who in the Twittersphere let another cup of tea get cold, bemoaned their dimpled thighs or caught the cat chewing their toothbrush? (Actually, a good warning in that last one maybe...). So when a particular course I’m doing decreed that we all must have a ‘presence on the ‘Net’—including on Twitter—I hit upon the amazingly unique idea of hiding behind one of my dogs (thanks Archie) and setting up the account in his name. And oh, how very unoriginal that turned out to be. A zillion dog owners throughout the world thought of this years ago. Many of them have four and five thousand followers! 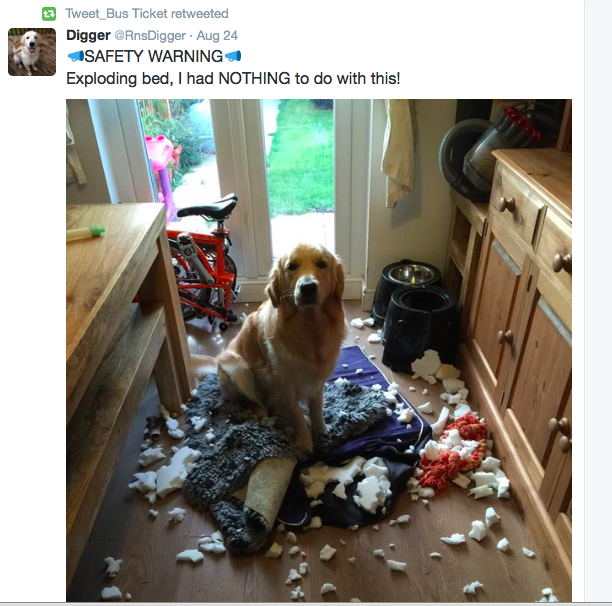 Digger (left) with his exploding bed - honestly! 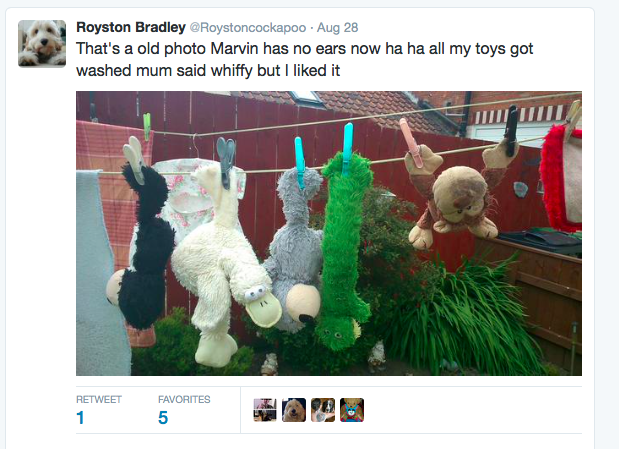 Or the beautiful Cockerpoo (I think we call them Spoodles), Royston Bradley, with a photo of all his toys pegged on the washing line '........ an old photo, Marvin has no ears now'. 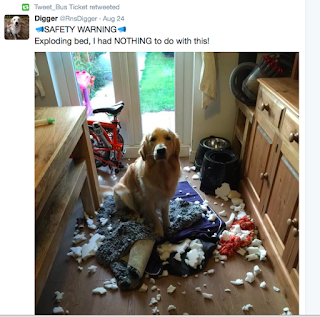 And countless trails of destruction—dog beds, shoes, videos, tv remotes, fruit from backyard trees—with cute photos offering funny justifications from the doggy perpetrators. I realise this is a bit like people trying to relate their dreams, isn’t it. Chances are you’re not falling around in helpless laughter as I often am when I waste time in the doggy Twittersphere. You have to be there. And thousands of dog-lovers the world over obviously are. Archie has clocked up 335 followers in his first few months. True! Most are from the UK, some from Canada and the US and a few from Australia and Europe. One devoted Follower is a German Neurophysicist now living in Ohio. Go figure. So look, I know it’s a time waster. There’s climate change, Donald Trump, Syria, Africa, refugees, shameful governments all over the world, broken promises and self-serving policies that will affect the state of humankind for centuries to come. How calming then, it is, to view a Tweet with accompanying photo of a brown cocker spaniel staring fixedly at a sunny window and the caption – “Looking for a fly.” It’s a great antidote, I can tell you. Check it out.